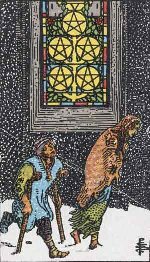 The Five of Pentacles or the Lord of Worry card, as the title suggests, appears when the subject is passing through some financial, material, domestic or health crisis. He sees a threat looming large on his overall sense of security. There may some unexpected financial loss or a marital discord. 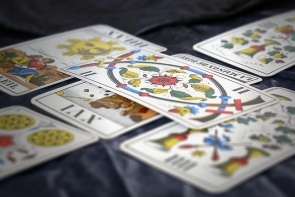 When presented with this card, it is an indication to worry about material things, particularly those concerned with career and financial matters. In some cases it is an indication of actual money loss or job or home loss, but it may only be temporary. 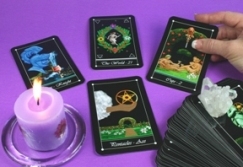 This card in a normal tarot spread indicates advisability of making a wise financial decision. In short, there is always some tension eating into the peace of mind. It must, however, be noted that whatever may the cause of your worry, it is only an imagined threat and may not turn into reality. Obviously, worrying too much may distort your vision and make the matters worse. You must know that whatever you put your attention on only grows. So if you just start worrying, you will not be able to act properly in eliminating the cause of the worry.